Unbreakable is the unbelievable story of two people forced together in unimaginable circumstances who overcome their fears and fall unequivocally in love. I devoured this book despite having to do things like go to work and be a mom. If I could have, I would have read it in one sitting. 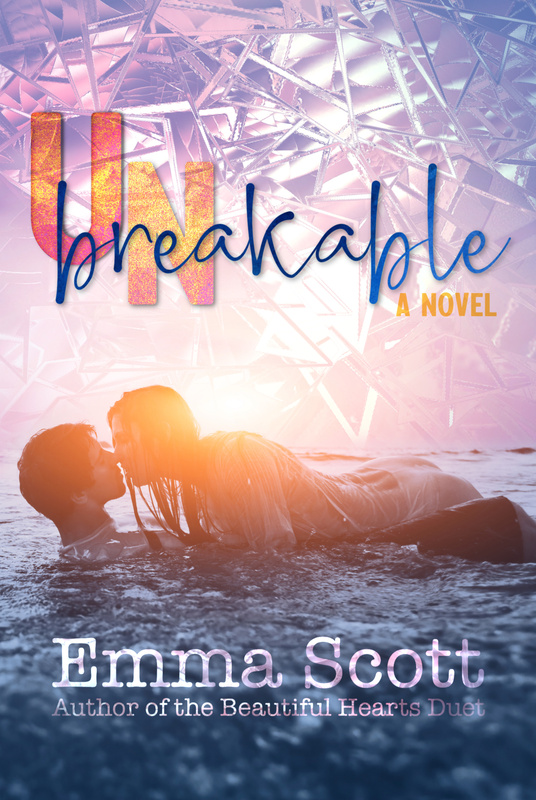 Emma Scott has brilliantly stuffed these pages with rich storylines, complex characters and so much love and healing that it’s impossible not to gush. The story begins in a fast-paced, edge of your seat, suspenseful description of our beloved characters being held hostage in a bank robbery. THIS is how they meet. It’s unthinkable. Terrifying. Then slowly, achingly, the story morphs into an angsty tangle of emotion, heartache, betrayal, and lust all whipped together and drawn out in the most exquisite way. By the time you reach the ending, you’re emotionally wrung out in the best possible way and needing an ending just as breathtaking as the beginning. And that’s exactly what you’ll get. I honestly can’t gush and squeal over this book enough. Cory is divine perfection even if he’s too proud and a little stubborn. He’s sweet and kind and loving and so MALE it almost hurts a little. Alex is a strong heroine. She smart, successful, hardworking and kind of ruthless. More than that, she’s real. She has real emotions and real reactions to horrifying situations. Cory and Alex together were electrifying. A smokin hot duo with too much standing in their way. You’ll be cheering them on from the first time they meet. You’ll be ENJOYING them while they enjoy each other and by the end, you won’t want to say goodbye. hangs just out of reach. they can’t break, even once outside the bank’s walls. move on and put the robbery–and each other–behind them. A good excuse. Plausible. No objections. But the simple fact remained that Iwanted to talk to Cory, to keep looking at his handsome face, and prove I could do so without melting into a puddle. overdrive against the Los Angeles summer heat, but I felt warm all over. And good. It felt nice to stand beside this handsome man and bask in his smile. I did yoga four times a week to keep the stresses of my job from wrapping me tight and squeezing. Talking to Cory Bishop for all of five minutes had the exact same effect. kind-hearted heroes, you will enjoy her novels.